Forty years ago, sculptor Richard Green envisioned an event that would bring together artists and craftspeople with the public during the beauty of Muskoka’s fall season. Featuring ten studios the first year, the Muskoka Autumn Studio Tour has grown into a community of creators that are recognized for the quality of their work and a passion for sharing it with others. Four decades of success prove that his vision found its mark. What better way to grasp the spirit that imbues an artistic creation than to meet its maker in the studio where it found life. Visitors can chat with the artist, learn about the materials and skills used in the medium, and watch a work in progress. The artwork that finds its way into a client’s home is much more meaningful when the new owner understands the process and inspiration. Close to one hundred artists have participated and tens of thousands of people have been welcomed into their studios. The concept of studio art tours spread to other regions, but none have been so thoroughly dedicated to the founder’s determination that the visitors have the full opportunity to be educated in the artistic process. ​The artists of 2018 invite you to join them for another exciting year. We look forward to new faces and reminiscing with those who have become friends over the years. 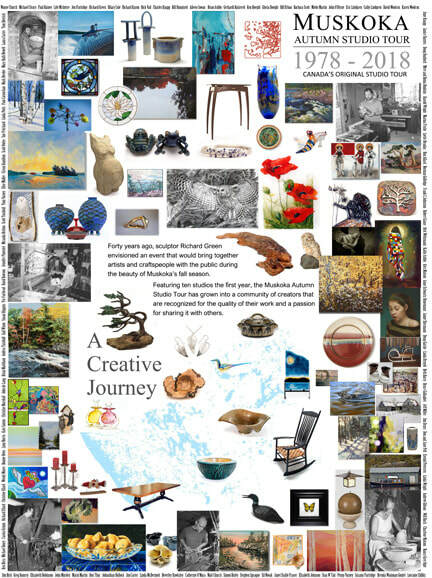 Come help celebrate our 40th year of the Muskoka Autumn Studio Tour. Visit one or all of these special group shows. Time Capsule to be opened during the celebration between 1pm - 4pm.